A trip to Iceland concentrates the mind on the subject of volcanism. Split between the separating-at-two-centimeters-a-year North American and Eurasian plates, Iceland is astride a tremendously deep plume of magma known as a hot spot. It has some major volcanoes, including Grimsvotn, Katla, Hekla, Krafla, and Laki. In 1963, a whole new island, Surtsey, named after the fire giant Surtur, emerged bubbling hot out of the water off the southern coast. (Cf. John McPhee’s two-part article on Heimaey, Surtsey’s neighbor.) This year’s smoker, Eyjafjallajökull, paralyzed Europe during the spring, but that’s nothing in comparison to blasts from the past. 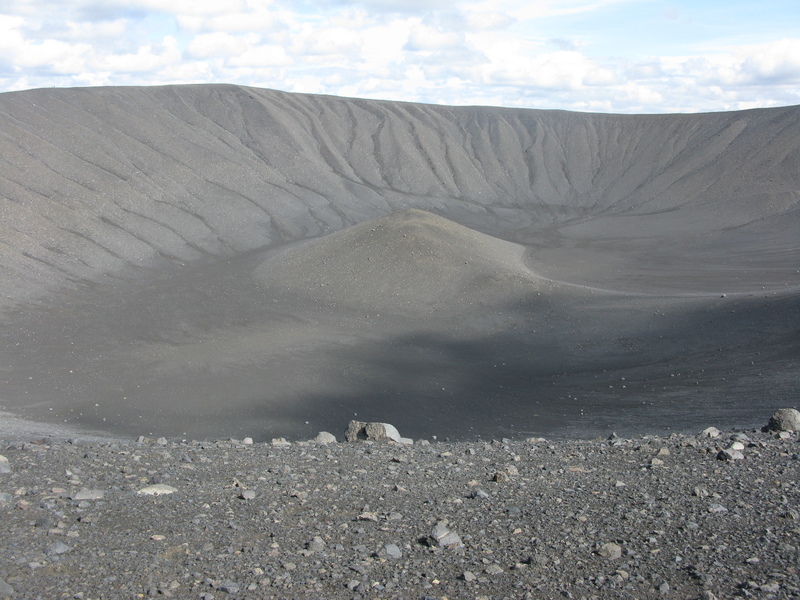 This is Hverfell, east of Myvatn, a tephra or ash cone. It is about 460m high and 1040m across. This volcanism does wonders for geothermal power, which lights up most of the country; natural hot tubs (ahhhhhh); geyser-steamed bread (tasty), and volcano tourism; it bodes ill for the future, though, and the inevitable cataclysms, which will not just be local. It was the Laki eruptions, the Skafka Fires, of 1783-84, in fact, which suggested to Ben Franklin — minding the store/impressing the ladies in Paris as our ambassador — that volcanoes could influence the climate; his thought — that the dry blue funk shrouding the City of Light was due to a volcanic eruption on Iceland — was the first documented making of that connection. Alas, nobody was reading him during the infamous “year without a summer,” 1816, when, following the eruption of Indonesia’s Tambora, the East Coast of the U.S. shivered through July and August (“ice made in pails”), and Mary Shelley, holed up in a damp, dank bust-of-a-holiday on Lake Geneva, started writing Frankenstein. The less literary effects were drought, crop failure, starvation, immigration, political upheaval, and huge numbers of dead around the world (hmm, sounds just like Planet Climate Change). Tambora 1815 was a 7 on the Volcanic Explosivity Index, described as “Colossal”; Krakatau 1883 a 6, “Huge”; in comparison Mount St. Helens 1980 was a 5, “Very Large.” Indonesia can also claim Toba, c. 74,000 years ago, which was an 8, “Humongous”; it’s thought to have ejected 1000 times the material St. Helens did. Our own metropolis occasionally feels a little tickle of a tremor from deep earthquakes in the St. Lawrence and Hudson valleys. It will probably come as a surprise to most, but the region has historically been subject to several 5 on-the-Richter scale quakes; the strongest was in 1836, an estimated 5.5, still rather moderate, under Gravesend Bay. That’s several miles from where I write, so quite local. However, our great reminder of the hot power of the earth is the purple majesty of the Palisades. From the Hudson River, Fall 2009. 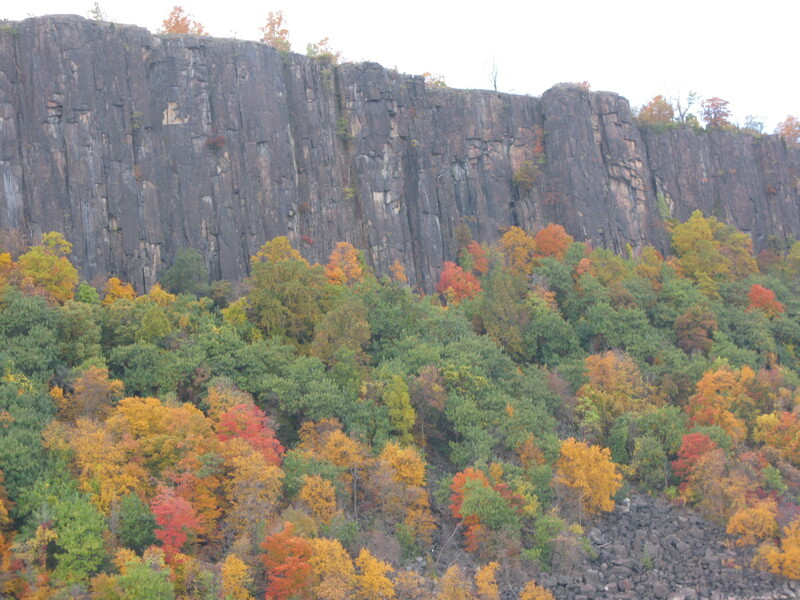 This cliff stretches from Jersey City to Haverstraw, about 35 miles, along the west coast of the Hudson. The column-like diabase was formed when a surge of magma intruded into weaker material, sandstone, underground. This sill eventually cooled and hardened. Over time, the material above the sill eroded away, exposing the sill’s flank to the hammer of time, air, water, and ice. Similar basalt forms were the subject of heated debate starting in the late 18th century, when the Neptunists — who thought such rock formed out of solution, after the great universal flood of the Bible — battled the Plutonists, who said it was volcanic in origin. The earliest field geologists pretty much had to become Plutonists; just look at Vesuvius, spewing lava like froth from a rabid dog; you could practically watch it cool into basalt. One of these was William Hamilton, English ambassador to Naples (technically, the Kingdom of the Two Sicilies). Hamilton was all over Vesuvius and the Campi Phlegraei (which is where Pozzuoli is), leaving the Mrs. at home with fires of her own to attend to (cf. Susan Sontag’s The Volcano Lover). A few months ago, I wrote a little about Pozzuoli’s importance in the history of geology. Spelunking into the literature of volcanoes, I learned that the town’s name in Roman times was Puteoli, and that it was long known as a source of volcanic ash, which, when mixed with lime, made an excellent hydraulic (water-resistant) cement, called pozzolana. Pozzolana was the foundation of Rome’s port at Ostia; it still holds up the Pantheon and Colosseum. This reminded me of tufa, a constant in my Italian childhood just north of Pozzuoli and Lago d’ Averno, the gateway to Hades. (What neighbors! Plus, you really had to watch out for the ornery three-headed junk yard dog down there). More generally called tuff, tufa is hardened ash; it was a popular building material. Soft enough to scrap with a fingernail, it was also rather lightweight: I vividly remember the tufa wall at Pinetamare Elementary School (Fifth grade; Miss Smith’s class; the school was then brand spanking new and right on the beach, which we were not allowed anywhere near), collapsing along one side of the playground during recess. A workman was toppled beneath the big color-TV-sized blocks, but he and his fellows pushed them off without much trouble or evident personal damage. All those crazy Norse gods & goddesses somehow make perfect sense in the context of such a wild and unpredictable landscape. Love the photos – beautiful Palisades – sad to see them so built on now when I look across the river. Though I harbor magical memories of Palisades Amusement Park with the ferris wheel all lit up & turning across the river. Note to out-of-towners: the section of the Palisades directly across the Hudson from Manhattan are developed south of the George Washington Bridge. North of that, the cliff is protected as a NJ-NY park. This wasn’t always so, of course; the cliffs were being attacked by quarry operations and loggers until the foundation of the Palisades Interstate Parks Commission in 1900. I really enjoyed reading this post, Matthew. You’ve pulled together so much information and made it interesting. I laughed at the VEI reference because it reminded me of black and white graphics I’ve seen for the Beaufort scale with upside down cars and sideways trees. Plus, we visited Ostia Antica and all the Rome highlights this past spring; I wondered how those walls could remain standing after so long. Thanks! A similar material was used for the hydraulic cement at the Suez canal, the ash taken from Santorini/Thira, the mighty Thera, whose explosion in mid 2nd millennium BCE may have destroyed Minoan civilization and given rise to the myth of Atlantis. I just wanted to let you know that I’ve included this post in the latest Scientia Pro Publica now up over on my blog. Do drop by when you have a moment. I’m on my way, Madhu. FYI everybody else: Scientia Pro Publica is a blog carnival of science writing for the rest of us, the lay people, that is.